We call her Ninang. That means "godmother" in Tagalog. She's the godmother of our group, which we call Berks (a term short for "barkada," the Tagalog word for "group of friends"). Our Berks is spread across the globe, a friendship forged online, so we've been keeping in touch mainly through Twitter. But for those of us who live in So Cal (Caroline and Remil), we've started tweat-ups -- meet ups with our twitter buddies -- regularly. So while I was in the Bay Area last week, I knew it was the right moment to have a tweat-up with Ninang. "Let's meet at the Ferry Building, Malou! You'll love it there," she suggested. Although it wasn't my first time to visit San Francisco, a city that I find so endearing that I could see myself living there, it was my first time to go to the Ferry Building. Ninang's choice was perfect for food bloggers, since the Ferry Building is like a mecca with all of its shops and markets. I was standing by the pier when Annapet came from behind me and she surprised me with an excited "boo!". Reeling in from the surprise, I asked her how she knew what I looked like, since this was our first time to meet in person. She laughed and reminded me that I had tweeted a picture of me waiting by the Transbay bus that brought me to San Francisco. Since my daughter lived across the bay, she was worried about me and the bus trip over to the city. So she took my picture with my outfit that I tweeted "just in case". I looked (and felt!) like a little school girl headed for a field trip as I stepped unto the school bus, while my daughter and her boyfriend looked from the sidewalk, waving goodbye to this bus. Talk about role reversals; my daughter was being so protective. 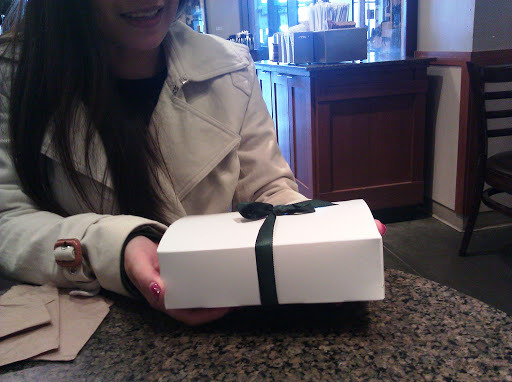 When someone hands you a box wrapped so nicely like this, what would you expect? Look closely. 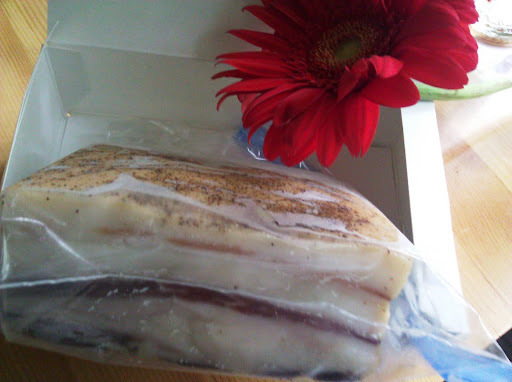 That's home-cured pancetta! And it's mangalitsa pancetta at that. How could I have missed it? When you visit my friend's blog, The Daily Palette, you will have all the clues that hint at what she loves. She loves gardening and cooking; she loves mangalitsa pork and who is into charcutepalooza. It may sound like I'm talking Greek, but drop by The Daily Palette and you will understand what I mean. This is the Ferry Market Building -- the site of our rendezvous. It was a gastronomical delight, with diverse choices. There were artisans and crafters selling their work of art... There were mushrooms and fresh cheeses. When you step outside, the city bustles with buildings and cabs. The landscape is so different from the inside, which looked more like a Farmer's Market. And it was so magical to see the Golden Bridge right outside. I was enthralled. It fed my soul like no other. It made me remember how I felt the first time I set foot in this city more than 20 years ago. My heart felt like singing Frank Sinatra's rendition of "I Left my Heart in San Francisco" as if it was the first time I visited this wonderful city. At that moment, I realized that I wanted to live in San Francisco again. But for now, I am comforted by the thought that I have a new friend in Annapet who lives there. Since Annapet is an active member of Kulinarya Cooking Club and Chartucepalooza, I made this post to hit two birds with one stone. This month's theme for Kulinarya is Flores de Mayo (flowers of May), and to incorporate her chartucepalooza project of pancetta, I made a plate of Palabok Pancetta. Palabok is a noodle dish with shrimp sauce whch has layers of garnishings. Traditionally, one may use gound pork or beef, but I replaced that with pancetta instead. I hope you enjoy this dish that's inspired by a new friendship and a new taste! Fry pancetta slices. Drain and set aside. Reserve the rendered fat from the pancetta. Pour rendered fat on the pan. Saute garlic and onions with oyster sauce. Add shrimp broth. Let it simmer. Season with fish sauce. Add cornstarch mixture to thicken the sauce. Crack a fresh egg and give it a quick stir. Boil water in a stockpot, Add noodles and let it stand for 5 minutes. Drain. Add 1 tbsp of rendered fat and toasted garlic. Toss and set aside. Put noodles on a plate. Ladle up a scoop of the shrimp sauce. Garnish with shrimp, boiled eggs, green onions, pancetta and tofu. The saltiness of the pancetta together with the shrimp sauce, the prawns and eggs will create a wonderful chorus in your mouth...hmmmm... YUM! Thank you Sefie of Sefie Eats and Connie of Home Cooking Rocks for the Flores de Mayo theme for this month's Kulinarya Cooking Club theme. How lovely to use the pancetta in the dish - it looks heavenly. I've never had it so will definitely check more. The generosity of bloggers is the perk of this lovely world. I left my heart in San Francisco when I was a child - ensuring I would always return. 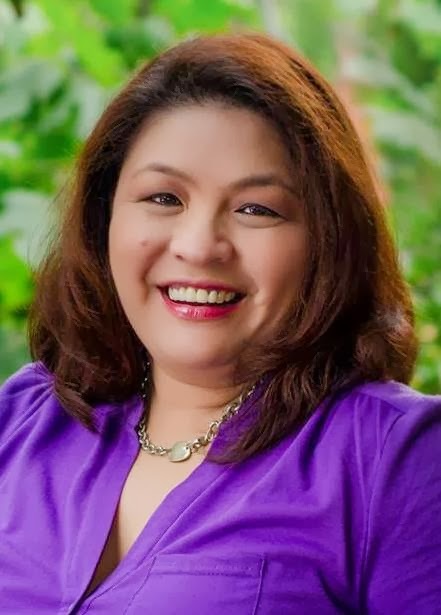 Thank you, Malou! So sweet of you to say. I have to agree, it felt like a REUNION not a first meeting! Like Heather, Lala was "coaching" me before I headed to catch my ferry to San Francisco. She even suggested that when there's an uncomfortable silence, I should yell, "LALA" or "REMIL" interchangeably. Well, you knew for Sharon and KC/Elaine, that never happened. Malou, you are very real, and definitely UNDERRATED, and I am ever so lucky you call me your friend. Pak! Hi Malou, Looks like you had a wonderful time in beautiful San Francisco, and especially meeting up with your friends. Hey, I live in So Cal, I could be your friend too, hahaha (just joking). Palabok looks very delicious. You are a good cook, an excellent writer, and a good friend to many. As always, thank you for sharing. I just saw your message on twitter, Malou. I hardly check. Sorry. What a wonderful idea meeting up with a virtual friend and such a wonderful present. You put it to good use in that delicious palabok. Yes! I was in Milwaukee with my family last weekend and my mom kept talking making palabok when she comes out to visit me - I bet she'd love the pancetta addition. HI Cludia! I think SFO is a magical city, everyone falls in love with it. I was lucky to have lived there, albeit a very short time. Annapet: oh yes we didn't need all those codes. It was chika at first sight haha. I hope to see you again sometime and thank you for taking the time to see me. Ray, you should join our tweets and our Tweat ups. I will let you know when the next tweat up is going to be and hopefully see you there! Chef D: HI thanks for dropping by. Great to see a KCC pal around. Marni: Im glad you had a Palabok fest with your mom haha. lucky you! Great to see you stop by. thanks! What a great adventure you had in San Francisco. I wish I could do that too. Drooling on your palabok. Im just afraid I don't know where to get pancetta here. What a beautiful account of your trip (and such beautiful photos). It has really amazed me how lovely and generous the world of food bloggers is! Its been really great! Glad you had such a good time and the Palabok looks delicious! What a lovely post! I'm glad you had a wonderful time meeting up an virtual friend and you two became official (traditional) friends. You were so lucky to have a nice weather during your visit because after that we have rain and cloudy weather... Even today! I love Ferry Building but with 2 small kids we barely enjoy as much as we used to. Your Palabok looks wonderful & delicious!